Are you in love with your hair color? If your answer is no, you should run to your favorite L’Oréal Professionnel salon and try their new service, “Hair Gloss: In Love With My Color”. At the press conference last Tuesday, Ivonne Vania, Product Manager Color L’Oréal Professionnel Indonesia said, “4.2 million Indonesian women are afraid to color their hair, based on our survey in salons. They afraid coloring might make their hair dry and brittle.” While me, (duh!) colored my hair like once a month. I believe this new service will be great for first timer aka virgin hair that never been colored before, and those who long for natural colored hair, with or without highlight. The difference with other coloring services? Hair Gloss will make your colored hair shinier and softer to touch. “If you want to covered your grey hair and if you want to make your colored hair look more natural, this service is also for you,” said Yola Sutjiutomo, Business Unit Manager L’Oréal Professionnel. Three different products are the key for this latest service, DIA RICHESSE, DIA LIGHT & PLATINIUM. Dia Richesse to cover grey hair and create natural colored hair. Dia Light will give extra shine and soft color. While Platinium creates a perfect, natural and soft highlight. There are 3 looks to inspire & most probably will make you fall in love with your hair color (again): GLOSS HIGHLIGHT, SOFT COLOR GLOSS & GREY BLENDING. As an addict for any hair color products or services available, I’d definitely try this service. I’ll keep you posted for sure. The very VIP spa room. Swimming pool inside the spa, exclusively for members. One of many awards they got. Traditional cart used for product display at the spa. Fabulous lip gloss that shine, literally! Product samples for us to try at the event. Last July, Mustika Ratu (which has been around for 38 years as one of the biggest jamu & cosmetic company in Indonesia) invited me, fellow bloggers & media friends to their media gathering event “The Beauty Statement”. The event was held at their first ever Taman Sari Royal Heritage Spa, located in Jalan Wahid Hasyim, Central Jakarta. It wasn’t my first time there, as I visited the spa many times before. I love the traditional therapies there, and the Javanese royals ambience they’re bringing to the spa (check out my pics above). We were break fasting together with delicious Indonesian meals, tried out new products, watched Mustika Ratu’s make up artist put on the makeup demo on one of our media friend & get an inside view about sleeping problems from Dwi Putri Yanthi, General Manager Marketing Pt Mustika Ratu, Tbk. At the very educative talk show, Dwi explained how many of us have sleep deprived problems due to stress and modern lifestyles in metropolitan cities such as Jakarta. But many didn’t know, it’ll cause bad side effects to our own immunity systems and in a long run, will cause cancer (I’m knocking on wood three times as I typed). Many rely on sleeping pills to beat their insomnias. But for those who opted for more safe yet reliable and natural ways, there’s help from Mustika Ratu, Sleepwell Tea. Yes, it’s tea, herbal tea to be exact. Made from natural active ingredients such as nutmeg, for quality sleep and fresher you in the morning. Try drinking one cup of Sleepwell Tea at least half to one hour before sleep. Not recommended for preggers and breastfeeders, it was said to relax and calm your muscles so sleeping won’t be an issue anymore. From a survey conducted by Mustika Ratu, 92% of those who’ve tried Sleepwell Tea slept easier after sipping their cup of tea before sleeping. I’m writing about eye brows embroidery. Lately, it’s booming everywhere in Jakarta, with all those different names and numbers. Why did I say “Sacrifice”? Imagine this, for a woman who washes her hair and face each time she takes a bath, it is a BIG DEAL. No water for 7 days near the eyebrows area is a BIG DEAL for me. Yup, I also freaked out about the idea of doing local topical anesthetic, since the heavy anesthetic I had when I got caesarian to deliver my first boy didn’t work on me (thanks to all those pain killers I took). Let’s just say: I am P.A.R.A.N.O.I.D. But, having a chat with Anggie Rassly herself(the lovely lady behind Brow Studio by Anggie Rassly), made me at ease. She said, “I’ll add the anesthetic cream if you still feel any pain while I do your embroidery.” Consultation with her is the first baby step before the whole brows embroidery thingy. She’ll ask about your best eyebrows moment, that moment when you felt you did great on drawing your own eyebrows (get some pics taken while at it). If you’re satisfied with her drawings, then it’s a go. Anesthetic cream was applied by her assistant, then she put the plastic wrap on top of each brows for about 15 minutes. And it all began. Ehm, him? Yup, FYI Anggie has many men clients. Apparently they wanted to get rid of their bushy brows. One of her men client, was an 11 years old boy. Seriously? “Yes, his mom brought him here, because he was playing around with a scissor and accidentally cut off his own eyebrows. So I fixed them for him,” said Anggie. Here comes the hardest part (at least for me): not washing your eyebrows for a week. No water, no cleansing milk, no toner, no nothing near eyebrows. Pronto! So what a girl should do? Here’s what I did: I didn’t wash my face in the shower like I used to do. I used facial wipes to clean my forehead, stayed away from any eye makeup for a week and washed from eyes down only. It should do the trick, even though at the fourth days (as I’ve been told by Anggie) they’re going to be itches and flaking process (see my pics for details). My verdict after the whole eyebrows embroidery thing? I regret all those moments in the past when I have to draw my eyebrows early in the morning while I was still sleepy and I regret that awkward moment when I popped out of the swimming pool with no eyebrows in tact. Nowadays, I wake up every morning with beautiful eyebrows. And….if I have one till two more years of these beautiful eyebrows in tact (that’s how long they’ll last so I’ve been told), I am a (really) happy woman. When I heard the name Carolina Herrera, I automatically think of her classic white shirt that never (ever) wrinkled and her undeniably graceful presence. She became a fashion designer because of her personal ‘best dressed’ style. So wonderfully dressed, her friend, Diana Vreeland (Editor-in-Chief of Vogue), suggested Carolina to built her own clothing line back in the 1980’s. So successful on the runways, late 1980’s, Carolina developed a line of perfume. And that was the beginning of the CH Fragrances universe. I was at the launch event of CH Eau De Parfum Sublime*, in Hotel Mulia Senayan, Jakarta last July. Held by Multi Wangi Alami Group (the main distributor for CH Fragrances in Indonesia), me, fellow bloggers and medias experienced five different theme rooms, identifying the five qualities of the CH Eau De Parfum Sublime woman. Ingenious, eternal, enigmatic, singular and attractive represented in each note, such as bergamot, rose, orchid, passion flower and patchouli from Indonesia! Apparently, we have the best patchouli (yippee!). And in each room, we were shown different master pieces from Carolina Herrera’s designs such as belt, headband, shoes, hand gloves and clutch, all decorated with a pretty bow. 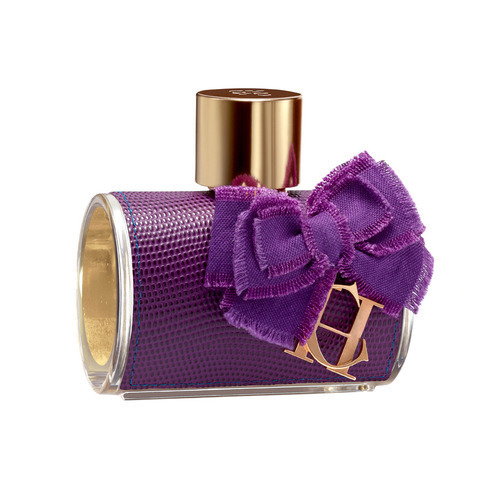 What made this EDP (yes they only come in Eau De Parfum) so irresistible? Well, as they said love comes at first sight…just look at the pretty bottle. It’ll surely become a delightful view for our dressing table. Take a glance and you already know that this fragrance captured the sublime essence of a woman’s femininity (just like the creator, Carolina Herrera de Báez said). Fresh, sweet, unique, enigmatic and sensual, all sides of a woman personified in a scent. *CH Eau de Parfum Sublime are retailing at Rp 1.000.000 (for 80ml) and Rp 1.260.000 (for 100ml). Same as my birthday month, shintarosvita.tumblr.com is officially turning 1. Thanks for my loyal readers, clients and brands who already trusted me of delivering the latest lifestyle news. Hope for more to come.